Making of the Abraham Lincoln Presidential Museum - What Were They Wearing? Each piece of clothing, whether painted in a mural or worn on three-dimensional figures, were meticulously researched, right down to the buttons, belts, and undergarments. 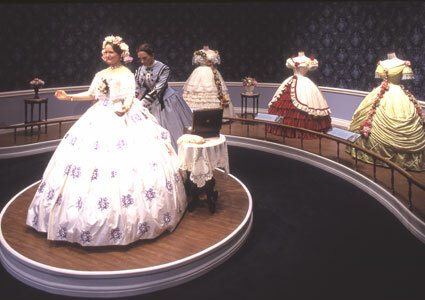 For example, in the exhibit, “What Are They Wearing in Washington?”, Mary Lincoln is being fitted for a gown, surrounded by her social rivals dressed for a ball. In conjunction with studying the dress and construction of clothing at the time, actual high-society women in Washington who had said something particularly nasty about Mary were researched. Next, photos or engravings of those women dressed in ball gowns were found. Articles of the period were located, such as one from Frank Leslie’s Illustrated Newspaper (New York), dated February 22, 1862, the night of the White House Ball recreated here, in which the event and what was worn is described. All this was closely studied and examined to create the beautiful and intricate gowns. 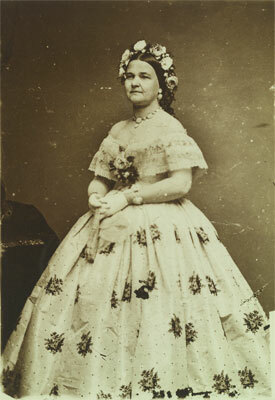 Engraving of Mary Todd Lincoln. "What Are They Wearing in Washington " exhibit.